We understand the injuries that often accompany even simple car accidents. 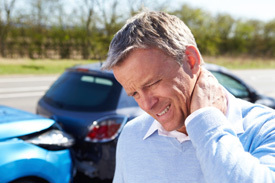 After being involved in an auto accident, you may experience soreness, stiffness and pain. The source of pain can be from a muscle strain, ligament sprain or bone fracture. These aches and pains you are experiencing after your car accident are an indication that your body has suffered damage. The symptoms of tightness, stiffness or soreness may appear next day or months after the accident. If ignored, the pain may go away, but the joint and muscles damage will not heal correctly. These untreated injuries can be the source of future pain, arthritis and dysfunction. The permanent damage that results may lead to a life of chronic pain and discomfort. We have the tools to diagnose and treat your injuries properly. We have an on-site digital x-ray lab and other diagnostic tools to locate and document the specifics of your injuries. Once we have diagnosed your injuries, treatment will consist of chiropractic and physical rehabilitation therapy to relieve your symptoms and restore function to the areas of injury. If you have been involved in a Woodbridge auto accident and need treatment, we will assist you with all billing questions and insurance issues. In most cases, your auto insurance will cover the expense of treatment. We will handle the entire billing process for you so you can focus on getting better. We are experienced in working on cases represented by a personal injury attorney, as well as those in which the patient has chosen not to seek representation.